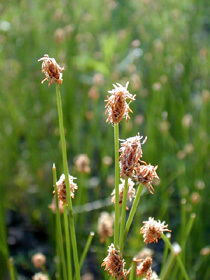 Also Called: Flat-stem spike-sedge, compressed spikerush. Culms: Erect, slender, 4 to 12 inches tall, with fine ridges (striate). The stem is flattened or "compressed" below the spikelet, i.e. it is conspicuously two-sided. Leaves: Bladeless sheaths at the base. Spikelets: Oblong or ovoid, up to .5 inch long, thicker than culm, many-flowered; scales ovate-lanceolate, golden-brown to reddish-brown with light to whitish margins; tip of scale long-pointed, whitish, often 2-cleft. Habitat: Low wet areas, marshes, sandy flood plains, woodland openings, and limestone glades; wet soils. Comments: Flat-stem spike-rush grows in mats. Long-stem spike-rush (Eleocharis palustris) occurs in similar habitats but can grow to 4 feet tall.